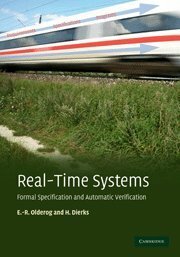 Real-Time Systems: Formal Specification And Automatic Verification: 9780521883337 Hardcover - LIMEROCK BOOKS INC.
Real-time systems need to react to certain input stimuli within given time bounds. For example, an airbag in a car has to unfold within 300 milliseconds in a crash. There are many embedded safety-critical applications and each requires real-time specification techniques. This text introduces three of these techniques, based on logic and automata: duration calculus, timed automata, and PLC-automata. The techniques are brought together to form a seamless design flow, from real-time requirements specified in the duration calculus; via designs specified by PLC-automata; and into source code for hardware platforms of embedded systems. The syntax, semantics, and proof methods of the specification techniques are introduced; their most important properties are established; and real-life examples illustrate their use. Detailed case studies and exercises conclude each chapter. Ideal for students of real-time systems or embedded systems, this text will also be of great interest to researchers and professionals in transportation and automation. An airbag in a car has to unfold within 300 milliseconds in a crash. Many embedded safety-critical applications like this, rely on real-time software specification techniques. This graduate textbook introduces three of these methods: duration calculus, timed automata, and PLC-automata.